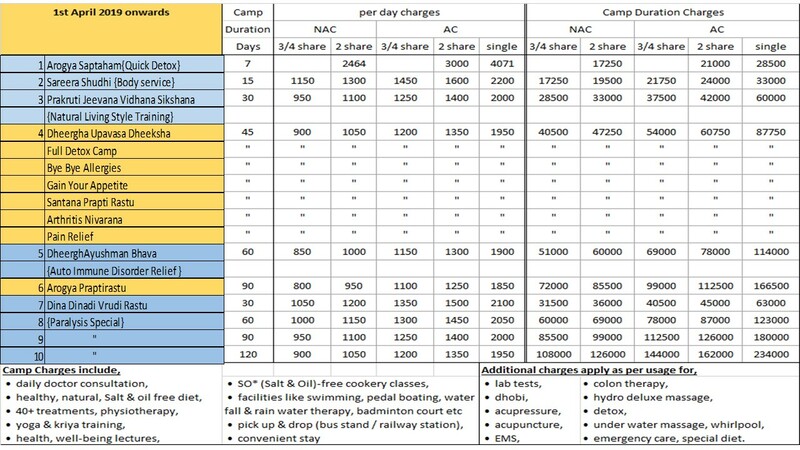 Room rent, treatment charges and diet charges are collected separately in many naturopathy hospitals. But in this Arogyalayam, all the facilities (except few special treatments) are embedded in one package rate as summarised below. 1. High capacity automatic generator ensures 24-hour lift facility, A/C plants, all kinds of treatments, sauna bath in rainy season or cloudy weather, and 24-hours hot water. 2. Solar hot water system for bath and treatments. 3. Drinking water (mineral water) plant. 4. Hot drinking water systems are conveniently fixed near to the rooms. 5. Drainage water is purified through treatment plant and left into Krishna river. 6. Facilities to play shuttle, tenni-koit (ring), and cricket. Swimming is taught and one can swim direct in Krishna water – life jackets are provided. 8. Boating in tourism boat in Krishna river for one hour for each batch. 9. Open air theatre where classes are held or sports are played. 10. Credit cards and debit cards are accepted and ATM facility is also available. 11. Facility to book reserved tickets by bus or train through internet booking in case of requirement. 12. Facility to wash and iron your clothes and their delivery at your room. 13. 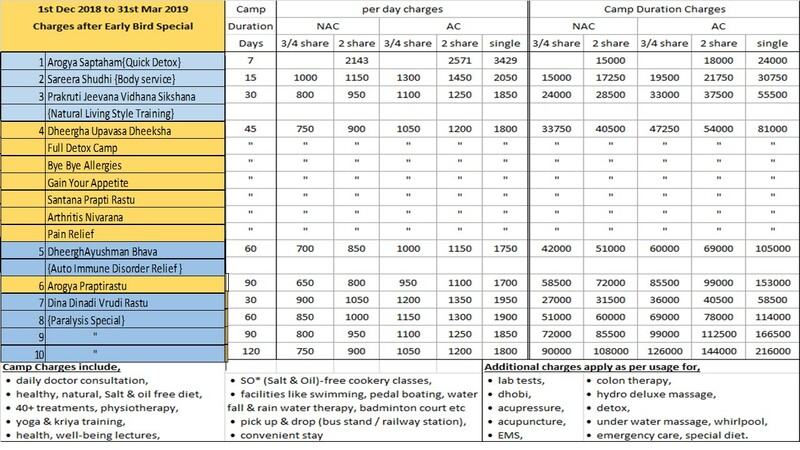 Special care taken for security of female health-seekers. Ladies coming alone are allotted in a building with maximum ladies. Special yoga classes and special even in exercise classes for ladies aged below 40. You won’t miss any festivals falling in between during your stay in Aarogyaalayam. You can celebrate it better than at home with Dr. Raju and his wife Dr. Visala. Every festival is celebrated in a traditional way with your participation, eatables including sweets are made by all together in natural way and they are all consumed together with traditional seating with serving of food on banana leaf. 7-8 types of food are served in lunch, traditional pan is served, ladies are provided flowers, games are played for entertainment, and cultural activities are arranged in night shows. Mainly festivals like Ugaadi, Vinaayaka Chavithi, Sree Krishnaashtami, Kartika maasa snaanam, Dhanurmaasa snaanam, Deepaavali, Dasaraa, are all celebrated, Creackers are arranged for all the health-seekers during Deepaavali. Therefore booking need not be postponed just because of a festival falling in between during your contemplated stay.